Our weather forecasting did not work out too well on Saturday at Canberra where the various models had a fair breeze for sailing the full sized rig in the Laser State Titles. 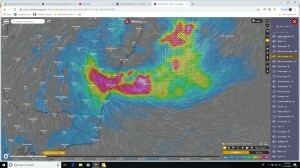 After surviving a wild afternoon where most of the fleet capsized at the gybe mark I am less sure of the various wind models. 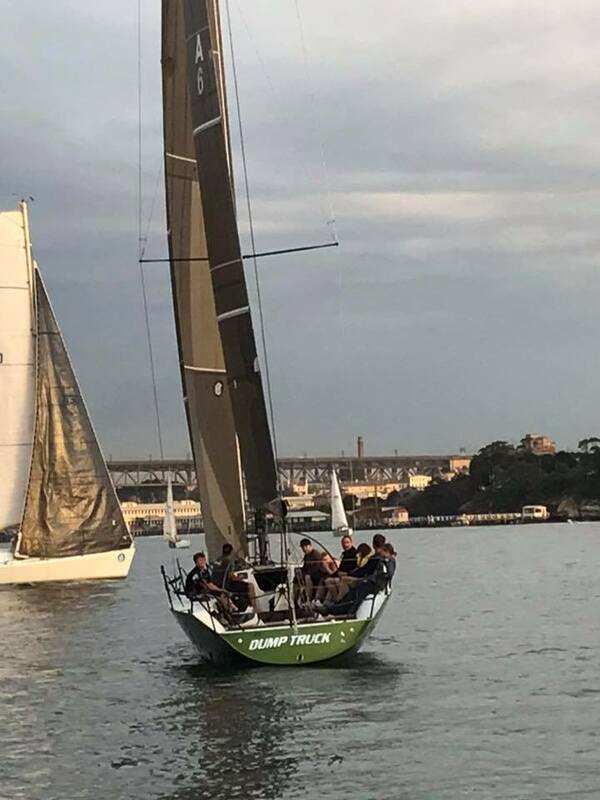 In Canberra on Sunday they were more accurate and we ended up with no racing due to lack of wind so the survivors of the three full rig races on Saturday did quite well. Fast forward to Tuesday and the forecasts for Wednesday are pretty challenging. 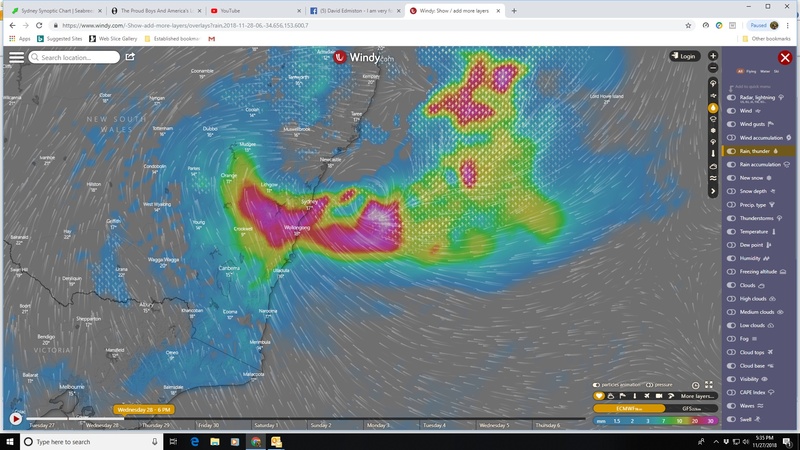 The day should start off wet with thunderstorms and a low pressure system should establish just off shore from Sydney directing strong southerly winds onto our course. The wind will abate further away from the coast but one of the forecast models has gusts to 40 knots on our race course area. 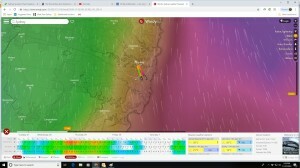 The challenge for course setters is that the weather system has not established yet and the distance the system has to travel until the start of the race tomorrow is quite substantial. Then there is the added concern that if the forecast is for the winds to be unsafe at 7 pm then what do they do at the scheduled start time? before the race the concern was whether we would have enough breeze for a race. 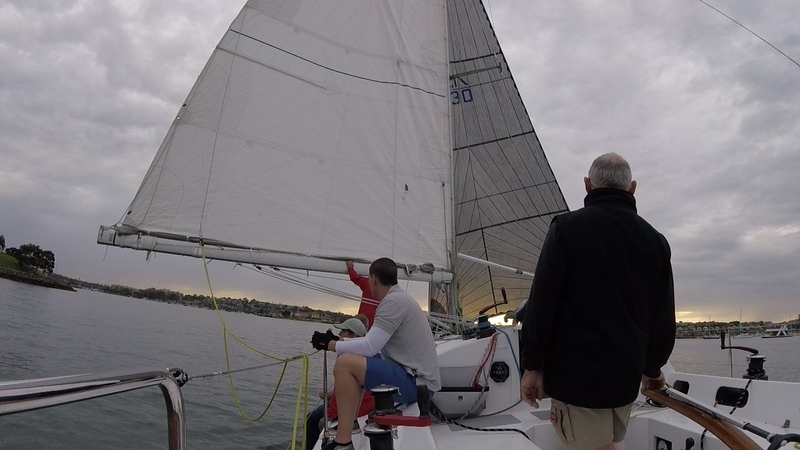 After deciding on the largest genoa for the race the breeze freshened to gusts of 17 knots but there were lots of holes so we decided to keep the full sail area. For the unusual north west breeze we planned to start near the club and be on the leeward side of Humbug and hopefully in better breeze. 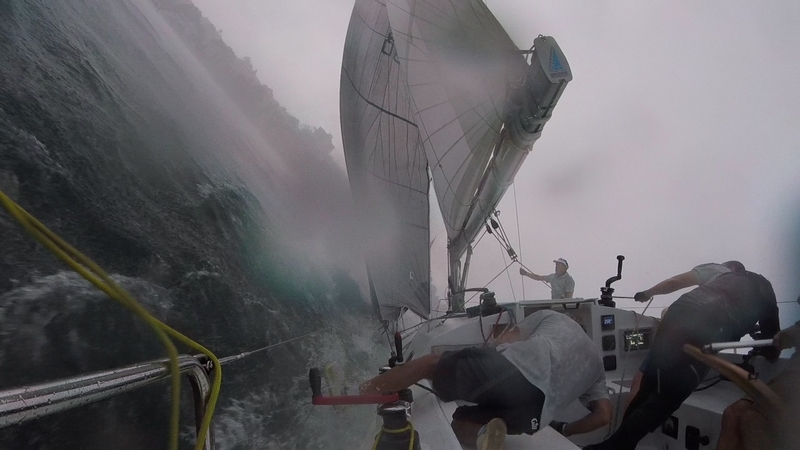 It did not work out in practice as Avalon started further to windward and carried a gust through Humbug and out into an early lead. The rest of us battled for clear air and eventually we abandoned our leeward position for one with clear air following Much Ado V, Dump Truck and Avalon. the big Ausreo was putting in an impressive performance and mixing it with the best at the front of the fleet, Avalon exlcuded. 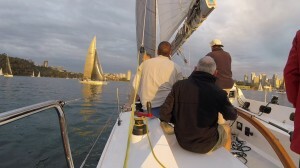 It was a long reach and then run from Cockatoo Island around Long Nose and then to take Goat Island to starboard. 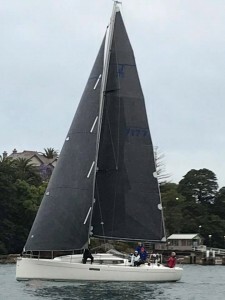 Much Ado V took the low path away from Balls Head and seemed to be heading for Goat to port but at the last minute changed course and came reaching up from below to regain a spot near the front of the Avalon pursuit. Flashback ran down on top of Utopia and Passion X as we lined up the navigation mark at Goat Island looking for a safe passage. We held back waiting for the clear ahead Blue fleet to round the mark and found a safe spot behind Caliban and inside Utopia. Now we were in the wind shadow of Goat Island and in the eddys from the island the wind was doing strange things. 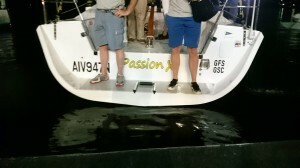 Utopia picked up a gust from behind and ran over the top of Passion X. Presently all chaos broke out in the fleet as a rain squall brought winds of 32 knots from different directions. 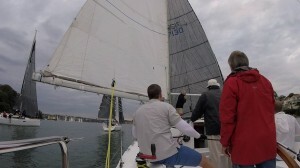 We flattened the sails and did our best to negotiate the many yachts. Out of the chaos Dump Truck emerged in front and Lisdillon came up from behind. The rest we could not see. The next we saw of Lisdillon was when they crossed us going into Long Nose. We held on longer in a lift and by the time we tacked on the next header had made a very large gain on Lisdillon. 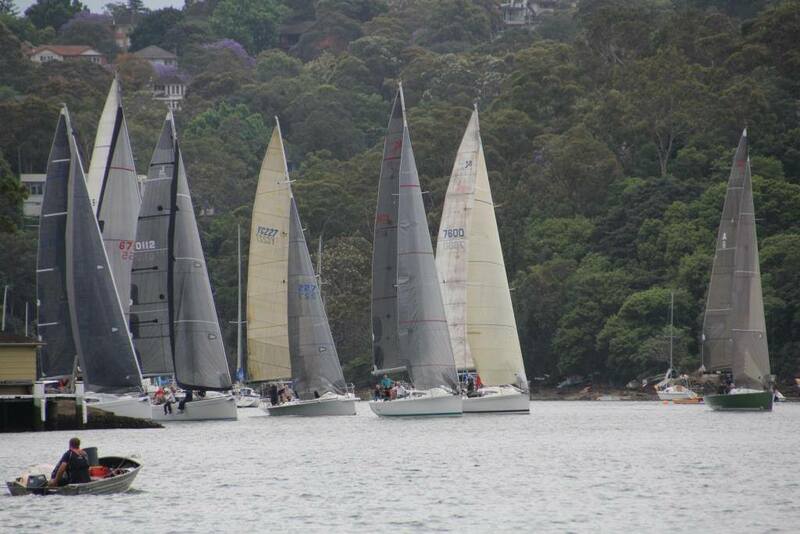 Irikandji came out of nowhere to be just astern but we picked a small breeze and pulled away again. Dump Truck, Ausreo and Utopia were parked off Greenwich Point so we sailed the long way around and eventually skirted Utopia and wore down Ausreo but could not make any headway on Dump Truck. Our fourth across the line was only good enough for 6th place as Avalon took the win by a 11 minutes from Ausreo Much Ado V and Dump Truck. I had thought that our 6 minute lead on Irikandji would be enough but we fell short by a minute and thirty eight seconds and had to settle for sixth place. In the pointscore the sixth is our worst place so it became our drop and we moved to the top of the table courtesy of the absence of Meridian and Joli who are cruising elsewhere this week. Our fourth across the line puts up temporarily third on the fastest times table courtesy of the race when no one finished being included in all competitors series. This means that Passion X which has raced in every event can drop the 11 point while anyone who was absent from a race gets to drop the did not start points but still carries the 11 points from the race where no one finished. 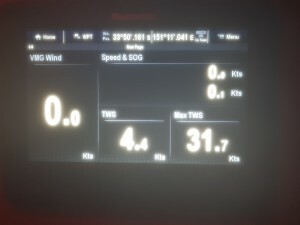 Maximum wind speed was 31.7 knots. Photo taken with a wet phone. 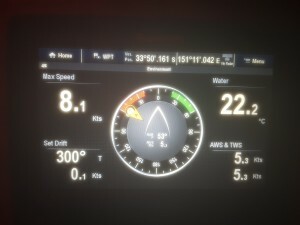 Top boat speed was 8.1 knots as we were beating into the squall. It would have been much higher has we been around Goat Island when it hit. A twisted pole topping lift delayed deployment of the big genoa but here it is two minutes later. 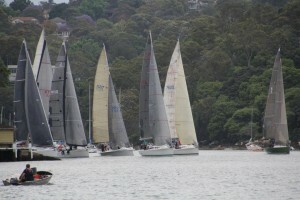 Utopia having a turn in front of the fleet. Avalon snatches the lead in the dying light. The end of the on water part of the evening. The Greenwich Flying Squadron facebook page has inspired keen photographers and there is lots of good viewing. Don’t let anyone tell you that you have taken too many photos and a big thank you to all the photographers. 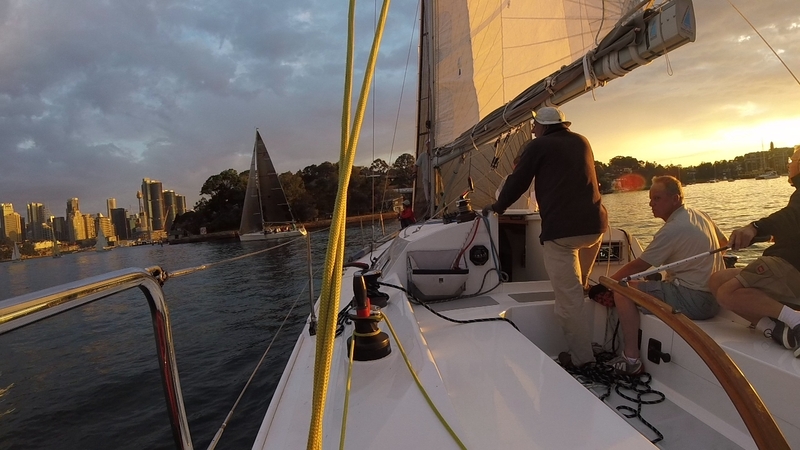 We had the gopro live last night and a few shots round out the commentary from the evening. While no one in the Black fleet finished the course on time we nevertheless had a very enjoyable and friendly tussle out on the course. 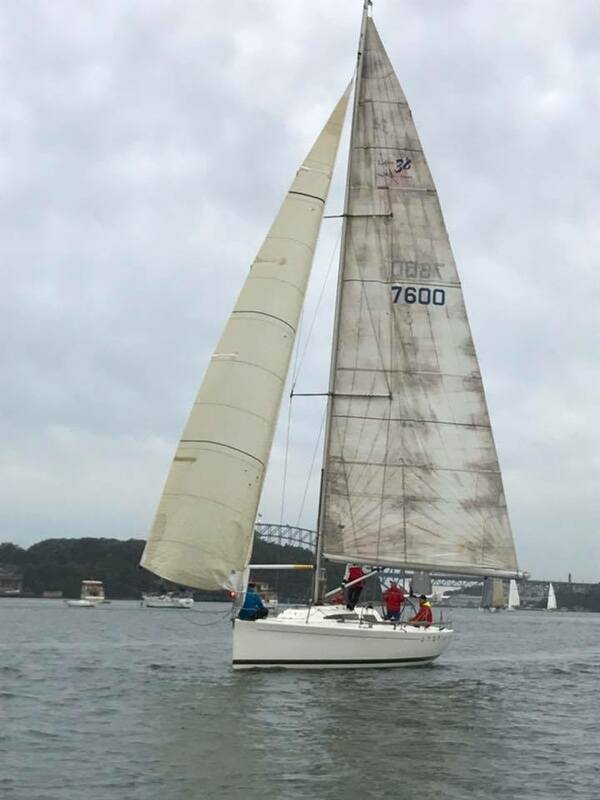 We did start in a very light Nor Easterly breeze that suited our low on the course position and once around Onion Point we were able to pole out our large overlapping genoa to good effect. The fingers of breeze channeling down the course favored first one side and then the next. 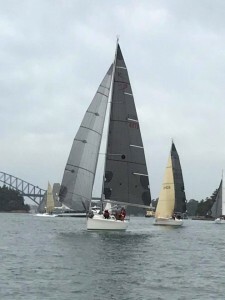 We were stuck to the north of the fleet running down the Hunters Hill side but were able to skirt the fleet to round Cockatoo Island just behind Utopia. Back on the wind on the way to Goat Island we held the fleet at bay while Utopia was first into fresher breeze ahead and pulled out a six boat length lead. Approaching Long Nose point the other fleets were becalmed so we went very wide only to have the short cutters on the two J112s lift around the point. We stayed in phase with the shifts and came out ahead of Utopia and only letting Avalon gain from the short cut. The rest of the work to Goat Island was frustratingly slow but we pulled back a little on Avalon and rounded in the dirty air of Much Ado V. Around the Island Joli overtook us to windward and Dump Truck came up from leeward. At this stage there was no wind on the water despite a nice showing from the flags on the Harbour Bridge. Meridian came up from behind and all of the fleet including the big Ausreo bunched up behind. 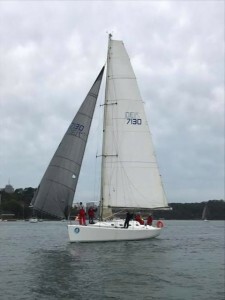 Avalon had now bolted and Much Ado V established a good break on a very large bunch of us including the 80th birthday celebrating crew on Flashback. Dump Truck correctly decided that the race was not going to be finished on time and started the engine. Once around Goat Island we could see Dump Truck pretending to Much Ado V that they were still in the race and catching them. 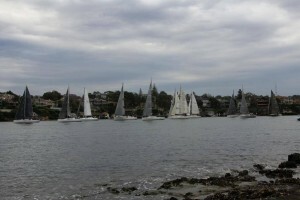 The rest of the optimists in the fleet were spread out across the river. Here we again did well to hold out the rest of the fleet although Flashback went wide around Greenwich Point and it would have been interesting to see how the race to the finish would have ended. For the record we did hold out Joli and the fast finishing Lisdillon but had it been a real race Lisdillon would have beaten Passion X on handicap. The Ker 11.3 twins approaching Goat island. 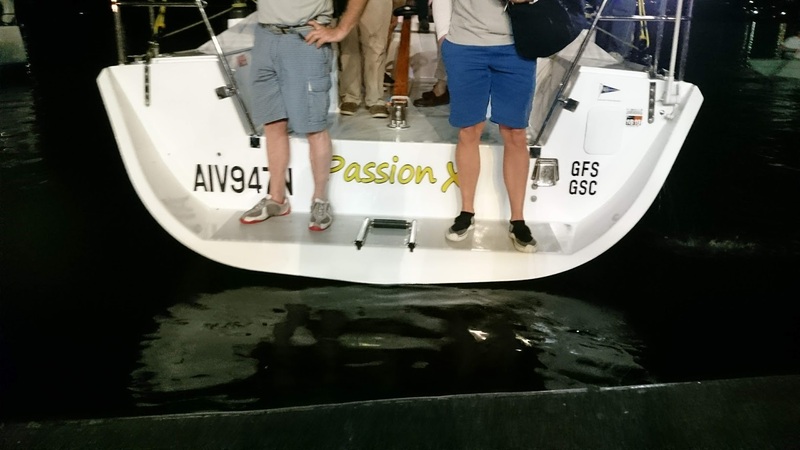 Passion with the old genoa brings up fourth place. The forecast south east fresh winds never arrived and in place was very mild winds of 7 knots dying to nothing at the finish. As the breeze faded those who had an early lead extended their lead and many handicap placings followed fastest times order. 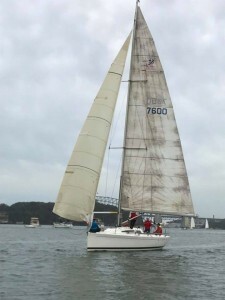 For our part we reflected on last week and thought a bit more flow in the foot of the main would be useful but in a nod to the expected strong winds set the 40m2 old genoa from Passion. 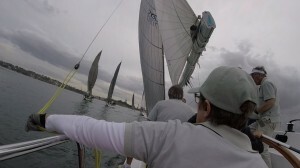 In the pre race quiet conditions this rig looked too flat and too little but we were expecting more. The start line was similar to last week so we opted to start further away from the club so that we could be leeward lifting boat at Onion Point. 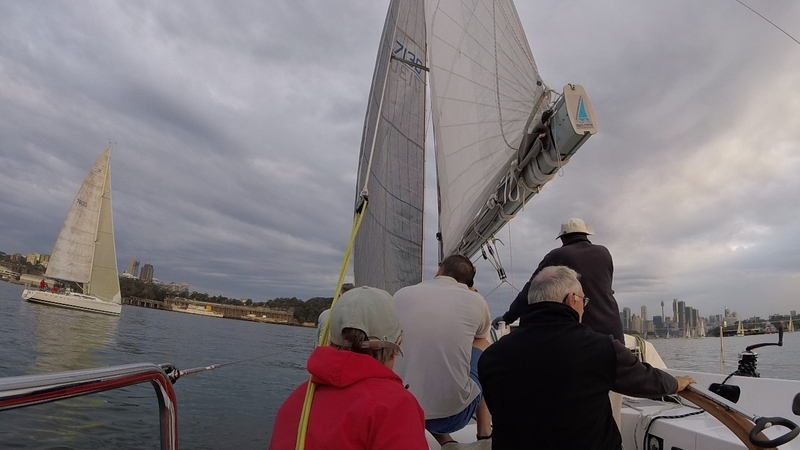 That did not work out as Meridian came up from beneath and took starboard rights down the line in front of us with enough room to cross us on the gun. That forced an early tack which was too low on Onion Point with an incoming tide and the tide at the lowest point. We pinched to make the point and crossed with 900 mm under the keel which is a bit close for comfort. 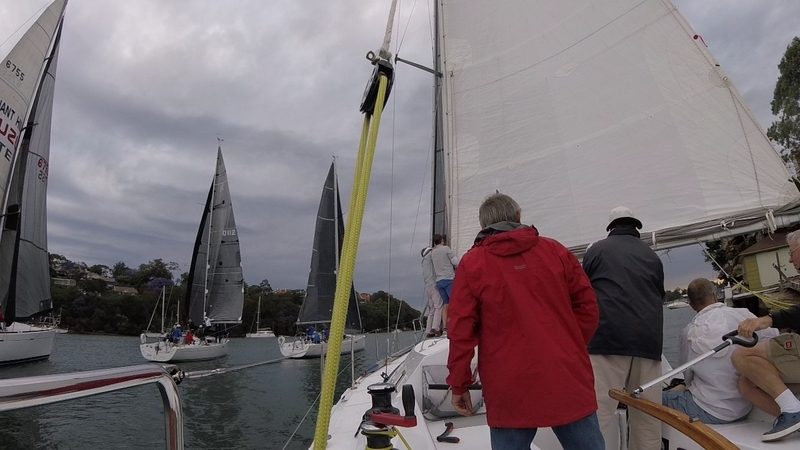 The yachts starting closer to the club had a better and faster lane into Humbug but fortunately they went a bit high leaving room for Passion X and Joli to pull under to leeward. 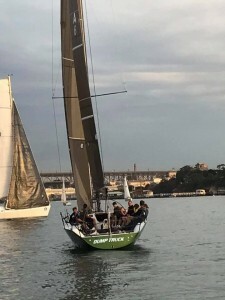 As we passed Clarke Point we were hard on the tail of Utopia who was nose to tail with Flashback while Meridian did the same as last week and took the inside rounding of Cockatoo without stopping. One day she will die in the wind shadow but not tonight. Utopia, Flashback and Passion followed in single file while Avalon went high. Avalon tacked closer to the island and managed to work out from under Passion X while Flashback and Utopia maintained a lead on both of us. Now Joli steamed up from behind and looked like going over the top until a knock put them into our dirty air and Kevin on the helm was able to work to windward. Back in the cockpit the crew was deepening the foot of the main even more while I was moving the jib cars forward and with these little improvements we started to hold Joli and pick up ground on Flashback. Approaching Goat Island we carried a lift into the Island further than we would usually risk but it paid off when we tacked on the first hint of a knock and lifted above Flashback enough to tack under them for the turn around the navigation mark. 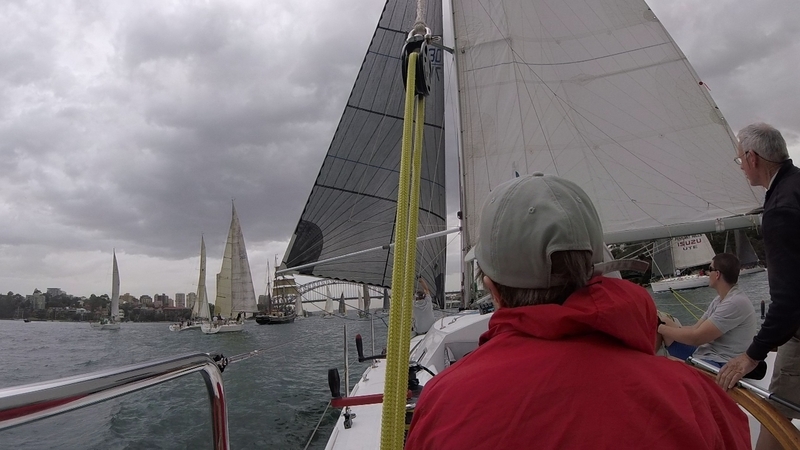 Flashback did not like our dirty air and it put them in the way of a couple Blue fleet yachts which also slowed them. Out of this one move we obtained a jump which by the finish in the dying breeze was worth seven minutes. Joli also had to negotiate this traffic and was similarly slowed. The run home was an anxious one as the dying breeze seemed to have streaks bringing the fleet down on us while we were not making inroads into the lead of Meridian, Utopia and Avalon. 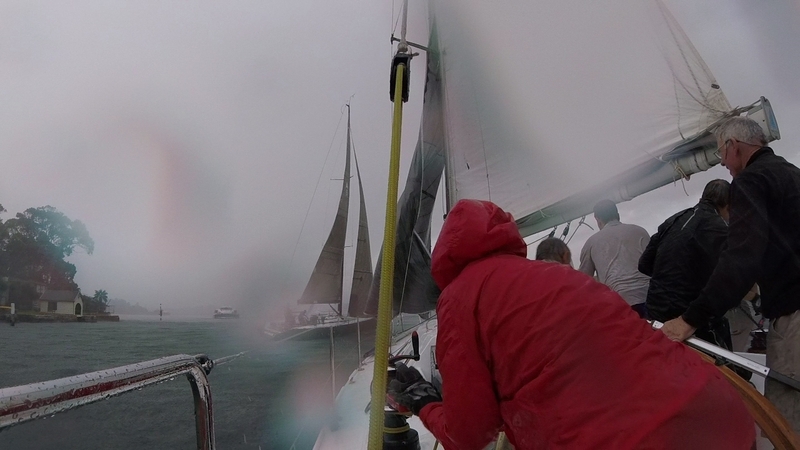 The last drift to the line was awful as the incoming tide was almost as strong as the breeze and the heading to make the finish line had to be much higher. 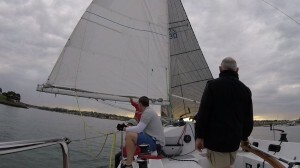 A couple of yachts did not make the buoy and had to do very slow re rounds. With the fourth across the line I expected to do well and was not disappointed with the fourth on handicap. 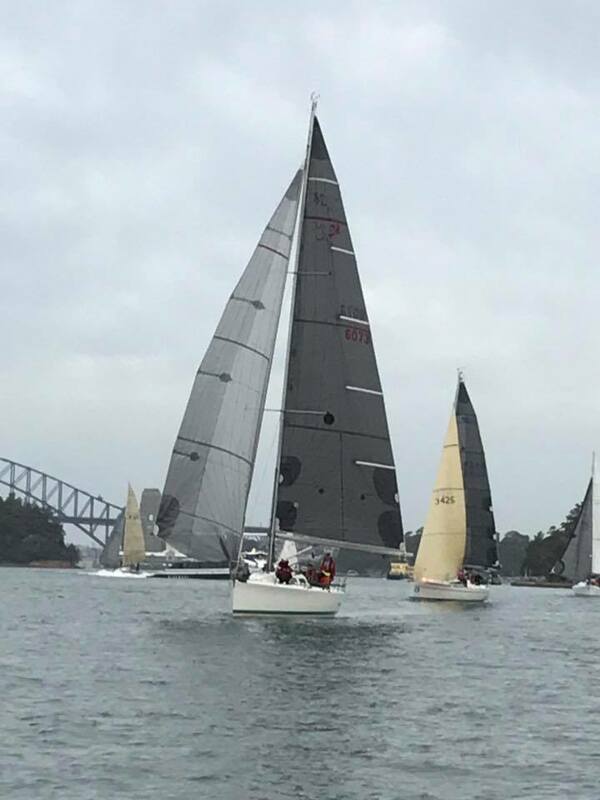 After the first four races of the season the two Sydney 38s, Utopia and Avalon at last received competitive handicaps and celebrated with a first and third respectively. The they had some taken back due to their success.